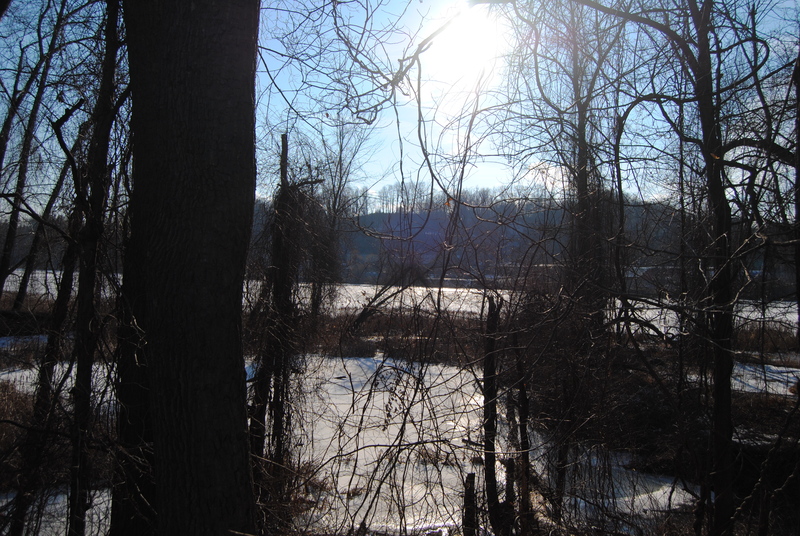 I am currently on assignment in Massachusetts – and we’ve had our share of snow in the last few weeks. It certainly makes me long for Latin America.. But while I may be in the northeast for the next several weeks, it doesn’t mean that I am hiding under a rock – so I continue to talk / read/ and research issues in medical tourism. The latest news from the Yorkshire Post is a timely and necessary reminder for all potential medical tourists and facilitators out there. The article discusses the recently published paper, entitled, “The three myths of medical tourism” as well as interviews with medical tourists. The paper is based on results of a study conducted at York University. Researchers at York University have an ongoing medical tourism project looking at multiple aspects of medical tourism including financial/ economic, as well as quality and continuity of care issues. – the lack of recourse for patients who experience complications/ serious injury or inadequate care. (It’s a black hole for medical malpractice at present). – The potential financial costs of complications: While some surgeons require their patients to purchase ‘complication insurance’ to cover treatment of complications (if they occur) in the home country, there is no universal requirement. Unfortunately, much of this work (by Lunt & Smith) is currently in-press. I’m anxious to see their reports but I am also wondering what sort of regional differences may exist. Medical tourism by British residents is often to neighboring areas of Europe, Eastern Europe, India and Israel. I’d be fascinated to see how that compares with outcomes and experiences for medical travelers to Latin America, and different South American countries in particular. In any case – it’s a timely report. Hard scientific information is dearly needed since the majority of data over the last decade has been anecdotal in nature or statistical “projections/ estimates / guesstimates”. Hard data is particularly important when it comes to allegations regarding poor post-operative care/ and increased incidence of infections (specifically in medical tourists from the UK who traveled to India). Many of these complaints arise from local plastic surgeons and may have little supporting data. If there is a problem, we need actual numbers, not case reports (particularly if we are dealing with antibiotic resistant infections). Quantitative data would also be helpful when discussing patient satisfaction and quality of care. Most of the time, statistics are bandied about from the Deloitte Institute – but I want to hear what patients think from other sources. How did patients rate their experiences in Britain? In California? Where were the patients going? What countries? What clinics were mentioned repeatedly? Researchers also found that medical travelers were poorly informed or ignorant of the risks involved with medical tourism. In some cases, patients were ‘willfully ignorant‘ and relied on social media and friends for all of their health information. A subset of these patients also traveled for unproven/ unregulated medical treatments (such as bovine stem cell injections). Many patients were ignorant of the risks or potential complications of the surgical procedures themselves (lap-band was specifically cited numerous times) as well as the problems that arise when your surgeon is thousands of miles away. Patients were also unaware/ poorly informed about the financial implications of developing/ treating complications in their home country – (or the costs involved if they needed to return to their surgeon). Some of the financial issues mentioned in this (and previous data I’ve encountered) is more specific to British residents with their National Health Services and it’s reimbursement structure. However, it’s not unimaginable to picture similar circumstances for uninsured medical tourists, or tourists seeking aftercare at an “out-of-network” facility once they returned to the USA. But what about the ‘caregiver’? Facilitators and medical tourism companies often tout the use of ‘caregivers’. This terminology is misleading in my opinion. In the usual course of surgery – as part of the pre-operative process, patients receive information, education and instructions during their initial consultation/ and pre-operative visits. This also gives patients a chance to ask questions, in-person to a medically knowledgeable person. Skype, and email just can’t replace this critical component. Many times, critical information is obtained (and given) by the surgical team during the physical examination and history-taking on the initial consultation. If the referring service is a layperson, and the initial (in-person) consultation takes place after the patient arrives in the destination country, these crucial education opportunities are lost. As readers know, I believe that regulation is both necessary and desirable to improve/ promote and grow the medical tourism industry. This regulation needs to be undertaken by knowledgeable people/ institutions outside of the industry. *In a related aside, one of the more popular Canadian medical tourism facilitators uses her unemployed sister in the role of ‘caretaker’. While the sister has no medical or nursing training, the facilitator bragged that it allows her to put her family on the payroll and bill the client for these services. Happy Thanksgiving to all of my American readers! I hope everyone has a wonderful and safe holiday. I’m home for a while, sort of. Now that I am home, I have been catching up on all of the local news – and it looks like Obamacare hasn’t really kicked off to a wonderful start. Of course, it was naive to think that anything SO large/ SO involved / Affecting some many people could go off without (several) hitches, but as one of the people losing their coverage because of it – I certainly understand all of the anxiety and worry out there. In the midst of continuing coverage of the current Obamacare fiasco, as millions of Americans lose their existing health care, several new articles on medical tourism have been making headlines across the country. Here’s a look at some of the latest news and reports from this past month. In the Bay Area, NBC news‘ Elyce Kirchner, Jeremy Carroll and Kevin Nious published “Medical tourism: the future of healthcare?” along with a televised report. It’s the usual patient narrative along with an overview of medical tourism. Kevin Gray, at the Men’s Journal talks about the domestic and international options available in his narrative, “Medical Tourism: Overseas and under the knife.” Gray takes a slightly different approach and discusses how consumers can comparison shop for health care services. Also, in counterpoint to the numerous press releases and newspaper articles talking about Iran, Bermuda, and various other medical tourism destinations seeking to “cash in” on the phenomena, British researchers (Lunt et al.) have published a report that contradicts the “if you build it, they will come” philosophy which has taken over the industry in many quarters. Medical News Today published a summary of their findings early this month. Researchers also point out that much of the credible data required to provide a full and accurate picture regarding medical tourism is absent. On a related note: While I talked about the limitations in medical tourism, accuracy of reported statistics and public perceptions in-depth during my 90 minute NPR interview, you wouldn’t really know it from my 2 sentence quote. USA Today also published a story on some of the pitfalls for destinations with thriving medical tourism. Kate Shuttleworth takes a look at the strain that Eastern European medical tourists have placed on some Israeli facilities. Is medical tourism on the rise? or is it all a spin of the numbers? I guess it all depends on who you ask.. But for now – Obamacare is not a viable alternative to medical travel. This is a page re-post to help some of my new readers become familiarized with Latin American Surgery.com – who I am, and what the website is about..
As my long-time readers know, the site just keeps growing and growing. Now that we have merged with one of our sister sites, it’s becoming more and more complicated for first time readers to find what they are looking for..
Let’s get down to brass tacks as they say .. Who am I and why should you bother reading another word.. I believe in full disclosure, so here’s my CV. I think it’s important that this includes financial disclosure. (I am self-funded). I’m not famous, and that’s a good thing. Of course, I also think readers should know why I have embarked on this endeavor, which has taken me to Mexico, Colombia, Chile, Bolivia and continues to fuel much of my life. I also write a bit about my daily life, so that you can get to know me, and because I love to write about everything I see and experience whether surgery-related or the joys of Bogotá on a Sunday afternoon. I interview doctors to learn more about them. Then I follow them to the operating room to make sure EVERYTHING is the way it is supposed to be. Is the facility clean? Does the equipment work? Is there appropriate personnel? Do the follow ‘standard operating procedure’ according to international regulations and standards for operating room safety, prevention of infection and overall good patient care? I talk about checklists – a lot.. I look at the quality of anesthesia – and apply standardized measures to evaluate it. I also write about new technologies, and treatments as well as emerging research. There is some patient education on common health conditions (primarily cardiothoracic and diabetes since that’s my background). Sometimes I talk about the ethics of medicine as well. I believe strongly in honesty, integrity and transparency and I think these are important values for anyone in healthcare. I don’t interview or encourage transplant tourism because I think it is intrinsically morally and ethically wrong. You don’t have to agree, but you won’t find information about how to find a black market kidney here on my site. What about hospital scores, you ask.. Just look here – or in the quality measures section. I also write about the culture, cuisine and the people in the locations I visit. These posts tend to be more informal, but I think it’s important for people to get to know these parts of Latin America too. It’s not just the doctors and the hospitals – but a different city, country and culture than many of my readers are used to. Why should you read this? well, that’s up to you.. But mainly, because I want you to know that there is someone out there who is doing their best – little by little to try to look out for you. See the sidebar! Check the drop-down box. Information about surgeons is divided into specialty and by location. So you can look in plastic surgery, or you can jump to the country of interest. Some of the listings are very brief – when I am working on a book – I just blog about who I saw and where I was, because the in-depth material is covered in the book. 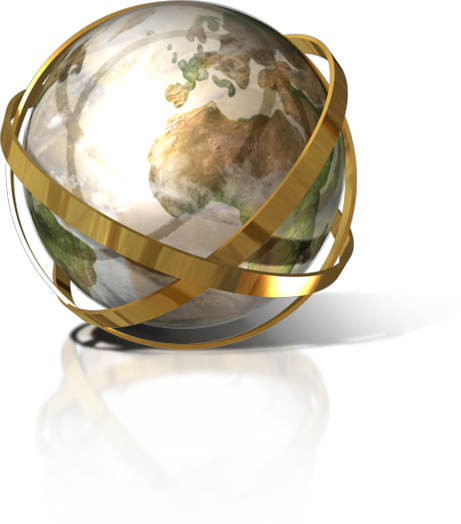 information about countries can be found under country tabs including cultural posts. Topics of particular interest like HIPEC have their own section. I’ve tried to cross-reference as much as possible to make information easy to find. and yes – I type fast, and often when I am tired so sometimes you will find grammatical errors, typos and misspelled words (despite spell-check) but bear with me. The information is still correct..
Dr. Gustavo Gaspar Blanco is a plastic surgeon in Mexicali (Baja California) Mexico. He is well-known throughout Baja and Northern Mexico for his gluteal augmentation techniques using gluteal implants. While this is one of the procedures he is most famous for, he also performs the complete range of body, facial plastic surgery procedures, and post-bariatric reconstructive surgery. 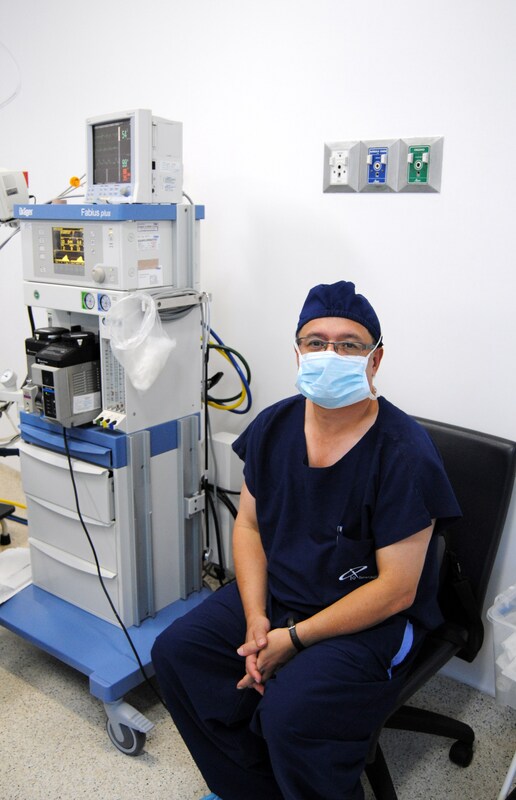 To read more about Dr. Gaspar in the operating room. There are multiple methods of gluteal augmentation (or buttock enhancement). 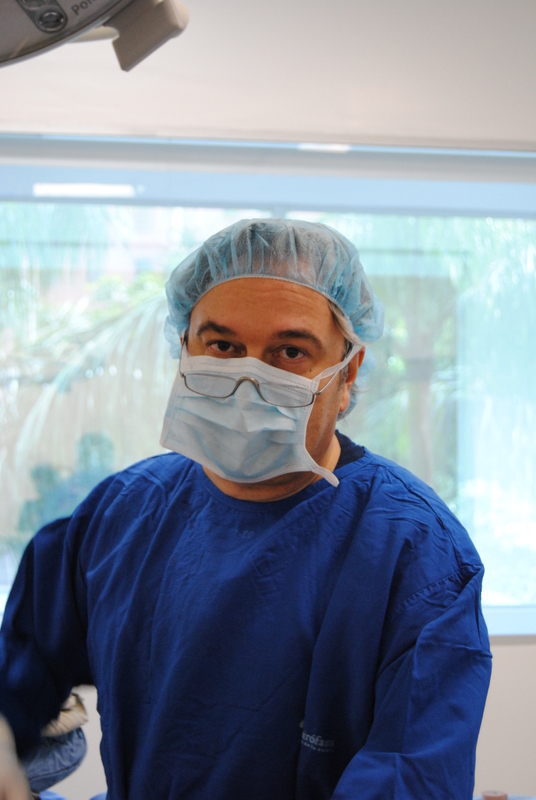 Dr. Gaspar performs both fat grafting and gluteal implantation procedures. He prefers gluteal implantation for patients who are very thin (and have limited fat tissue available for grafting) or for patients who want longer-lasting, more noticeable enhancements. (With all fat injection procedures, a portion of the fat is re-absorbed). He recommends fat grafting procedures to patients who want a more subtle shaping, particularly as part of a body sculpting plan in conjunction to liposuction. Like most plastic surgeons, breast augmentation is one of the more popular procedures among his patients. The vast majority of his patients receive silicone implants (by patient request), and Dr. Gaspar reports improved patient satisfaction with appearance and feel with silicone versus saline implants. He uses Mentor and Natrelle brand implants, and is very familiar with these products. In fact, he reports that he has visited the factories that create breast implants in Ireland and Costa Rica. He says he visited these factories due to his own curiosity and questions about breast implants**. Once he arrived, he found that each implant is made by a time-consuming one at a time process versus a vast assembly line as he had envisioned. He was able to see the quality of the different types of implants during the manufacturing process. These implants, which range from $800.00 to $1200.00 a piece, go through several stages of preparation before being completed and processed for shipping. He also watched much of the testing process which he found very interesting in light of the history of controversy and concern over previous silicone implant leakage in the United States (during the 1960’s – 1970’s). Another aspect of breast augmentation that Dr. Gaspar discusses during my visits is the breast implantation technique itself. While there are several techniques, in general, he uses the over-the-muscle technique for the majority of breast implantation procedures. He explains why, and demonstrates with one of his patients (who had the under-the-muscle technique with another surgeon, and now presents for revision). Instead, he reserves the under-the-muscle implant for specific cases, like post-mastectomy reconstruction. In these patients (particularly after radiation to the chest), the skin around the original mastectomy incision is permanently weakened, so these patients need the additional support of the underlying muscle to prevent further skin damage. While his clients, from all over North America, are familiar with his plastic surgery results, few of them are aware of his deep commitment to maintaining the highest ethical and medical standards while pursing excellence in surgery. 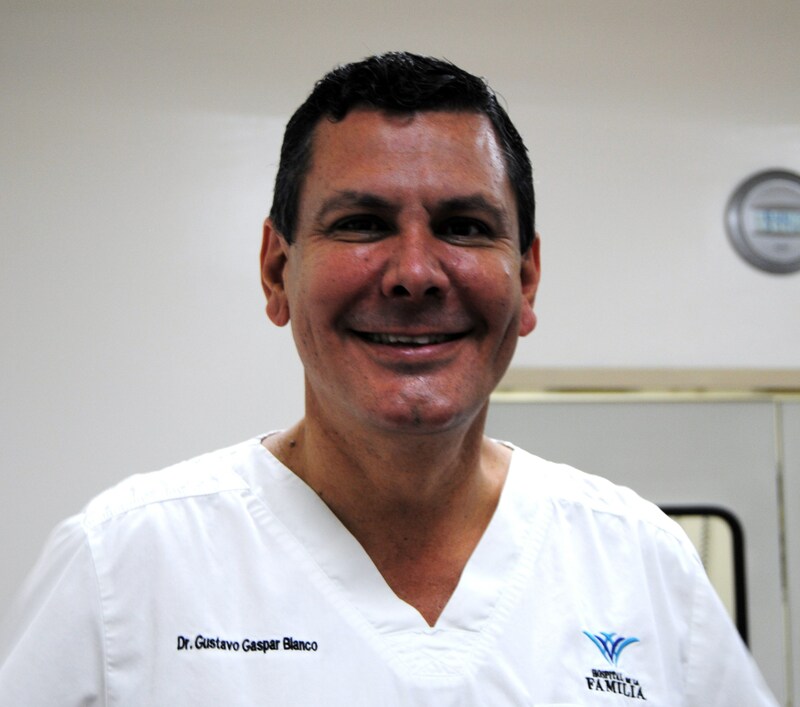 While Dr. Gaspar is primarily Spanish-speaking, his commitment to ethical practice is crystal clear in any language. He explains these ethical principles while offering general guidelines for patients that I will share here (the principles are his, the writing style is my own). – Plastic surgery is not a weight-loss procedure. Liposuction/ Abdominoplasty is not a weight loss procedure. Plastic surgery can refine, but not remake the physique. Obese or overweight patients should lose weight prior to considering refining techniques like abdominoplasty which can be used to remove excess or sagging skin after large-scale weight loss. – Have surgery for appropriate reasons. Plastic surgery will not make someone love you. It won’t fix troubled relationships, serious depression or illness. Plastic surgery, when approached with realistic expectations (#3) can improve self-esteem and self-confidence. – Realistic expectations – just as plastic surgery won’t result in a 25 pound weight loss, or bring back a wayward spouse, it can’t turn back the clock completely, or radically remake someone’s appearance. There is a limit to what procedures can do; for the majority people, no amount of surgery is going to make them into supermodels. Not only are there limits to what surgery itself can do, there are limits to the amounts of procedures that people should have, particularly during one session. “Marathon/ Extreme Makeovers” make for exciting television but are a dangerous practice. Just as patients should avoid marathon or multi-hour, multiple procedure surgeries, patients should stay safe. As Dr. Gaspar says, “The safest place for patients is in the operating room.” With the exception of Botox, all plastic surgery procedures should be performing the operating room, not the doctor’s office. This is because the operating room is a sterile, well-prepared environment with adequate supplies and support staff. There are monitors to help surgeons detect the development of potential problems, life-saving drugs and resuscitation (rescue) equipment on hand. Should a patient stop breathing, start bleeding or develop a life-threatening allergic reaction (among other things), the operating room (and operating room staff) are well prepared to take care of the patient. – know a detailed history including all past medical problems/ conditions and surgeries. If you had heart surgery ten years ago – that’s relevant, even if you feel fine now. Have a history of previous blood transfusions/ radiation therapy/ medication reactions? Be sure to tell the doctor all about it. Even if you aren’t sure if it matters, “My sister had a blood clot after liposuction” – go ahead and mention it.. It might just be a critical piece of information such as a family predisposition to thromboembolism (like the example above). Surgical complications are a part of surgery. All surgeons have them – and having a surgical complication in and of itself is no indication of the quality or skill of the surgeon. Complications can occur for a variety of reasons. However, how efficiently and effectively the surgeon treats that complication is a good indicator of skill, experience and expertise. As part of this, Dr. Gaspar stresses that medical tourism patients need to prepare to stay until they have reached an adequate stage of recovery. This prevents the development of complications and allows the surgeon to rapidly treat a problem if it develops; before it become more serious. Dr. Gaspar attended medical school at the Universidad Autonoma de Guadalajara. He completed both his general surgery residency and plastic surgery fellowship in Mexico City at the Hospital de Especialidades Centro Medico La Raza. He is a board certified plastic surgeon by the Mexican Society of Plastic and Reconstructive Surgery, license number #601. He has been performing plastic surgery for over 20 years. Surgeons from areas all over Mexico train with Dr. Gaspar to learn his gluteal implantation techniques. ** He has also visited the facilities in Germany where the Botulism toxin is prepared for cosmetic/ and medical use. Now that Colombia Moda is over – let’s get back to the stuff that really matters.. Let’s warm up but reviewing some older posts for our newer readers. I know some readers find some of my reporting dry and uninspired, particularly when talking about methodology, measurements and scales such as Surgical Apgar Scoring. But the use of appropriate protocols, safety procedures and specialized personnel is crucial for continued patient safety. There is a saying among medical professionals about our patients.. We want them all to be boring and routine. That is what I strive for, for each and every one of my readers – safe, boring and routine. Excitement and drama are only enjoyable when watching Grey’s Anatomy or other fictionalized medical dramas. In real life, it means something has drastically and horribly gone awry. Unlike many of its fictional counterparts – outcomes are not usually good. Please note that some of the images in this article have been edited to preserve patient privacy. Today, Dr. Luis Botero has invited me to observe surgery at IQ Interquirofanos in the Poblado section of Medellin. He is performing full-body liposuction and fat grafting of the buttocks. 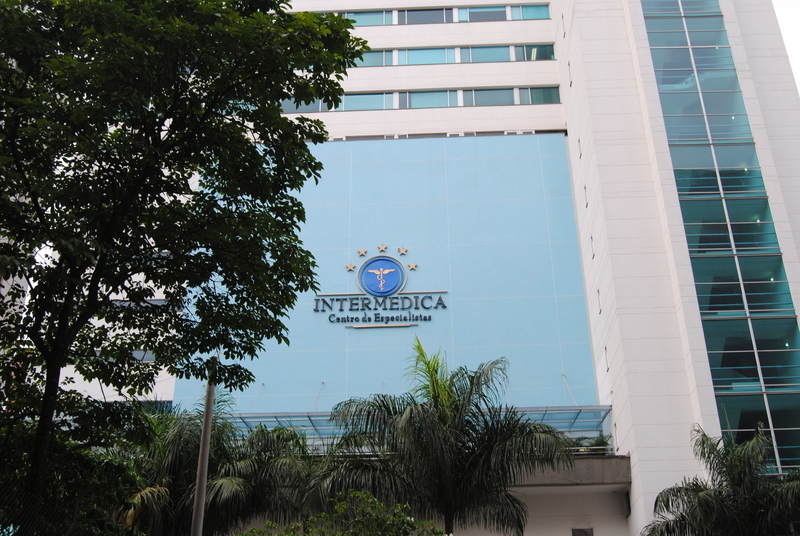 IQ Interquirofanos is an ambulatory surgery center located on the second floor of the Intermedica Building across the street from the Clinica de Medellin (sede Poblado). The close proximity of this clinic to a hospital is an important consideration for patients in case of a medical emergency. The anesthesiologists estimate that 90% of the procedures performed here are cosmetic surgeries but surgeons also perform gynecology, and some orthopedic procedures at this facility. The are seven operating rooms that are well-lit, and feature modern and functional equipment including hemodynamic monitoring, anesthesia / ventilatory equipment/ medications. There are crash carts available for the operating rooms and the patient recovery areas. There are fourteen monitored recovery room beds, while the facility currently plans for expansion. Next door, an additional three floors are being built along with six more operating rooms. Sterile processing is located within the facility with several large sterilization units. There is also a pharmacy on-site. 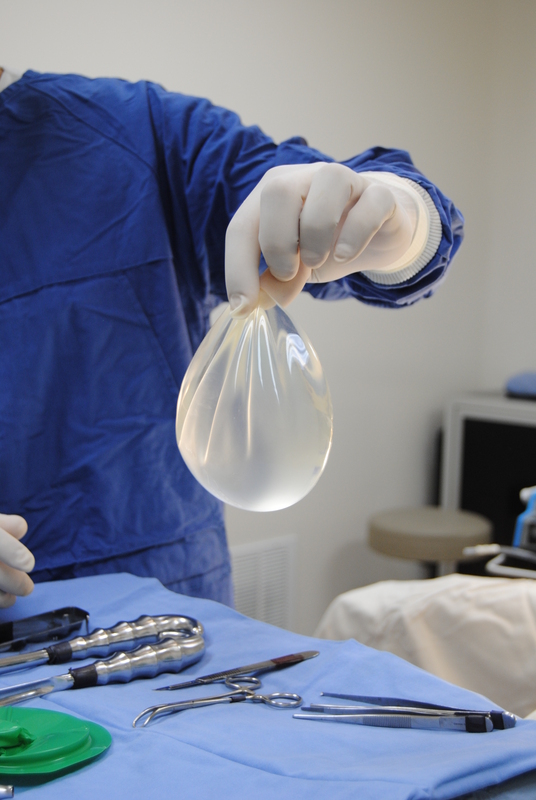 The pharmacy dispenses prosthetics such as breast implants in addition to medications. The only breast prosthetics offered at this facility are Mentor (Johnson & Johnson) and Natrelle brand silicone implants (Allergan). In light of the problems with PIP implants in the past – it is important for patients to ensure their implants are FDA approved, like Mentor implants. 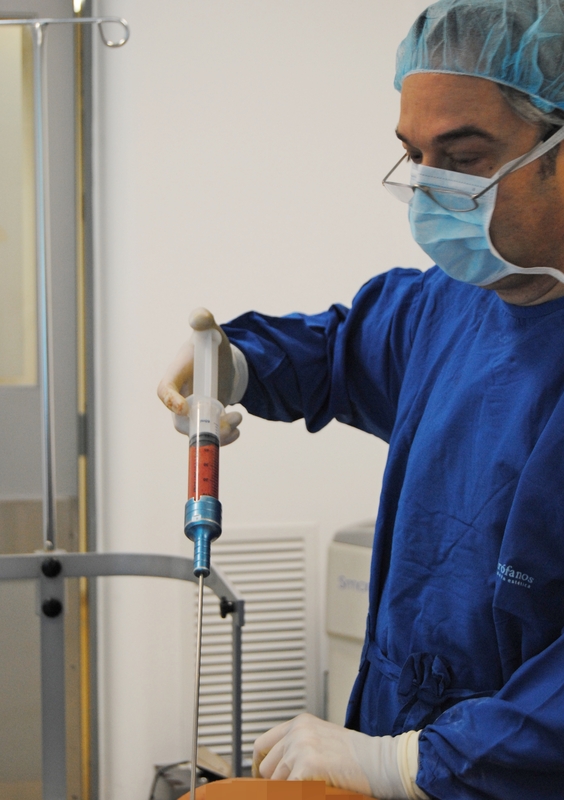 In the past seven years, over 31,000 procedures have been performed at Interquirofanos. The nurses tell me that during the week, there are usually 30 to 35 surgeries a day, and around 15 procedures on Saturdays. Prior to surgery, patients undergo a full consultation with Dr. Botero and further medical evaluation (as needed). Patients are also instructed to avoid aspirin, ibuprofen and all antiplatets (clopidogrel, prasugrel, etc) and anti-coagulants (warfarin, dabigatran, etc.) for several days. Patients should not resume these medications until approved by their surgeon. All patients are required to purchase complication insurance. This insurance costs between 75.00 and 120.00 dollars and covers the cost of any treatment needed (in the first 30 days) for post-operative complications for amounts ranging from 15,000 dollars to 30,000 dollars, depending on the policy. All of his clients who undergo surgery at IQ Interquirofanos are encouraged to buy a policy from Pan American Life de Colombia as part of the policies for patient safety at this facility. International patients may also be interested in purchasing a policy from ISPAS, which covers any visits to an ISPAS-affiliated surgeon in their home country. Liposuction – Liposuction (lipoplasty or lipectomy) accounts for 50% of all plastic surgery procedures. First the surgeon makes several very small slits in the skin. Then a saline – lidocaine solution is infiltrated in to the fat (adipose) tissue that is to removed. 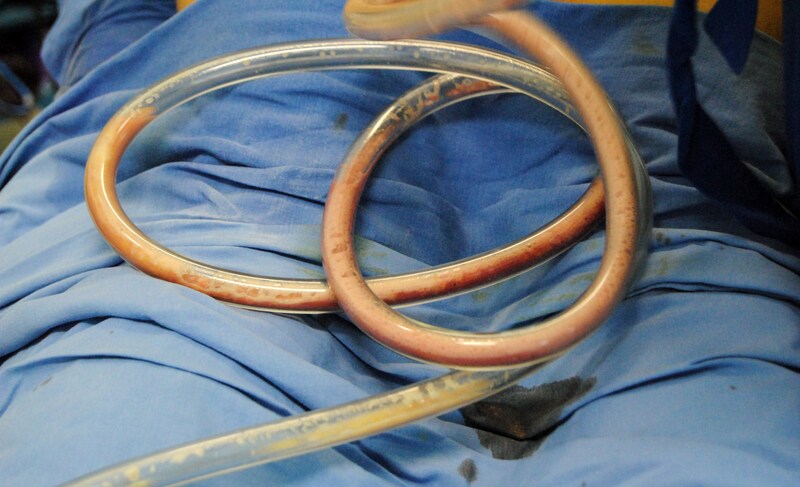 This solution serves several purposes – the solution helps emulsify the fat for removal while the lidocaine-epinephrine additives help provide post-operative analgesic and limit intra-operative bleeding. After the solution dwells (sits in the tissue) for ten to twenty minutes, the surgeon can begin the liposuction procedure. For this procedure, instruments are introduced to the area beneath the skin and above the muscle layer. During this procedure, the surgeon introduces different canulas (long hollow tubes). These tubes are used to break up the adipose tissue and remove the fat using an attached suctioning canister. To break up the fat, the surgeon uses a back and forth motion. 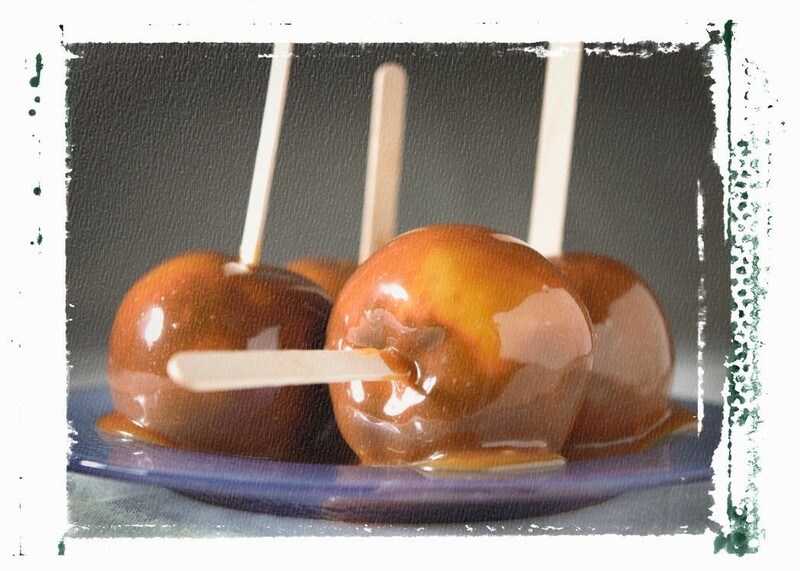 During this process – one hand is on the canula. The other hand remains on the patient to guide the canulas and prevent inadvertent injury to the patient. Due to the nature of this procedure, extensive bruising and swelling after this procedure is normal. Swelling may last up to a month. Patients will need to wear support garments (such as a girdle) after this procedure for several weeks. In recent years, surgeons have developed different techniques and specialized canulas to address specific purposes during surgery. Standard liposuction canulas come in a variety of lengths and bore sizes (the bore size is the size of the hole at the end of the canister for the suction removal of fat tissue.) Some of these canulas have serrated bores for easier fat removal. Ultrasound-assisted liposuction uses the canulas to deliver sound waves to help break up fat tissue. These canulas are designed for patients who have had repeated liposuction. This is needed to break up adhesions (scar tissue) that forms after the initial procedure during the healing process. Laser liposuction is another type of liposuction aimed at specifically improving skin contraction. This is important in older patients or in patients who have excessive loose skin due to recent weight loss or post-pregnancy. However, for very large amounts of loose skin or poor skin tone in areas such as the abdomen, a larger procedure such as abdominoplasty may be needed. During laser liposuction, a small wire laser is placed inside a canula to deliver a specific amount of heat energy to the area (around 40 degrees centrigrade). The application of heat is believed to stimulate collagen production (for skin tightening). Bleeding is reduced because of the cautery effect of the heat – but post-operative pain is increased due to increased inflammatory effects. There is also a risk of burn trauma during this procedure. There have been several other liposuction techniques that have gone in and out of fashion, and many of the variations mentioned are often referred to by trademark names such as “Vaser”, “SmartLipo”, “SlimLipo” which can be confusing for people seeking information on these procedures. Fat grafting is a procedure used in combination with liposuction. With this procedure, fat that was removed during liposuction is relocated to another area of the body such as the buttocks, hands or face. In this patient, Dr. Botero injects the fat using a large bore needle deep into the gluteal muscles to prevent a sloppy, or dimpled appearance. Injecting into the muscle tissue also helps to preserve the longevity of the procedure. However, care must be taken to prevent fat embolism*, a rare but potentially fatal complication – where globules of fat enter the bloodstream. To prevent this complication, Dr. Botero carefully confirms the placement of his needle in the muscle tissue before injecting. fat being injected for buttock augmentation. (Photo edited for patient privacy). Patient was appropriately marked prior to the procedure. The patient was correctly prepped, drapped and positioned to prevent injury or infection. Ted hose and sequential stockings were applied to lessen the risk of developing deep vein thrombosis. Pre-operative procedures were performed according to internationally recognized standards. 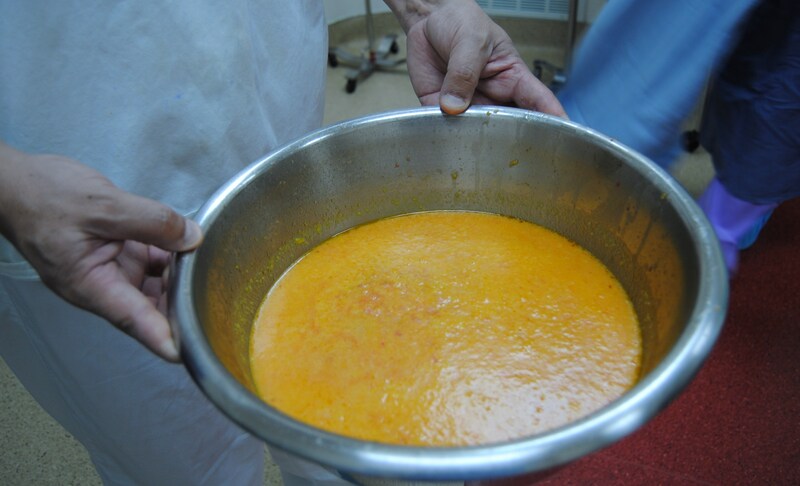 Sterility was maintained during the case. Dr. Botero appeared knowledgeable and skilled regarding the techniques and procedures performed. His instrumentadora (First assistant), Liliana Moreno was extremely knowledgeable and able to anticipate Dr. Botero’s needs. Circulating nurse: Anais Perez maintained accurate and up-to-date intra-operative records during the case. Ms. Perez was readily available to obtain instruments and supplies as needed. Overall – the team worked well together and communicated effectively before, during and after the case. However, as the name inplies – controlled hypotension is a tightly regulated process, where blood pressure is lowered to a very specific range. This range is just slightly lower than normal (Systolic BP of around 80) – and the anesthesiologist is in constant attendance. This is very different from cases with profound hypotension which is ignored due to an anesthesia provider being distracted – or completely absent. With hypotensive anesthesia – blood pressure is maintained with a MAP (or mean) of 50 – 60mmHg with a HR of 50 – 60. This reduces the incidence of bleeding. However, this technique is not safe for everyone. Only young healthy patients are good candidates for this anesthesia technique. 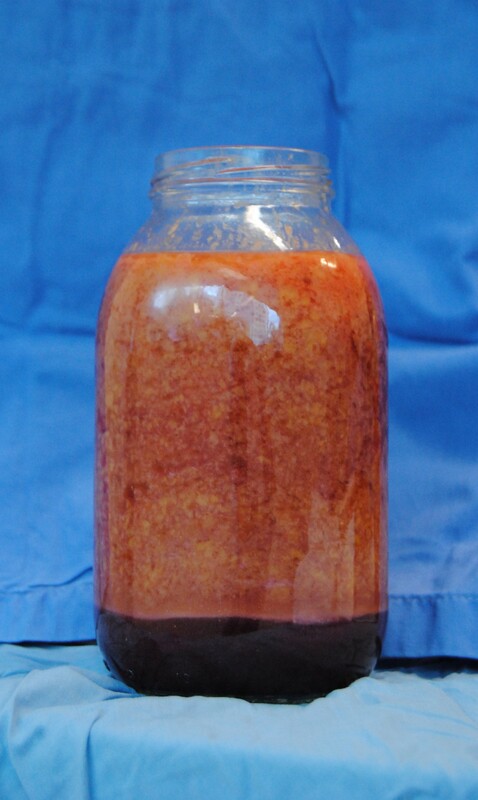 Basically, if you have any stiffening of your arteries due to age (40+), smoking, cholesterol or family history – this technique is NOT for you. People with high blood pressure, any degree of kidney disease, heart disease, peripheral vascular disease or diabetes are not good candidates for this type of anesthesia. People with these kinds of medical conditions do not tolerate even mild hypotension very well, and are at increased risk of serious complications such as renal injury/ failure or cardiovascular complications such as a heart attack or stroke. Particularly since this is an elective procedure – this is something to discuss with your surgeon and anesthesiologist before surgery. The patient today is young (low 20’s), physically fit, active with no medical conditions so this anesthesia poses little risk during this procedure. Also the surgery itself is fairly short – which is important. Long/ marathon surgeries such as ‘mega-makeovers‘ are not ideal for this type of anesthesia. However, Dr. Arango does an excellent job during this procedure, which is performed under general anesthesia. After intubating the patient, he maintained a close eye on vital signs and oxygenation. The patient is hemodynamically stable with no desaturations or hypoxia during the case. Dr. Arango remains alert and attentive during the case, and remains present for the entire surgery. Following surgery, anesthesia was lightened, and the patient was extubated prior to transfer to the recovery room. He also demonstrated excellent knowledge of international protocols regarding DVT/ Travel risk, WHO safety protocols and intra-operative management. Surgical apgar score: 9 (however, there is a point lost due to MAP of 50 – 60 as discussed above). Results of the surgery were cosmetically pleasing. Prior to discharge from the ambulatory care center after recovery from anesthesia the patient (and family) receives discharge instructions from the nurses. 1. Oral antibiotics for a five-day course**. Dr. Botero uses this duration for fat grafting cases only. 2. Non-narcotic analgesia (pain medications). 3. Lyrica ( a gabapentin-like compound) to prevent neuralgias during the healing period. The patient will wear a support garment for several weeks. She is to call Dr. Botero to report any problems such as unrelieved pain, drainage or fever. Note: after some surgeries like abdominoplasty, patients also receive DVT prophylaxis with either Arixtra or enoxaparin (Lovenox). * Fat embolism is a risk with any liposuction procedure. **This is contrary to American recommendations as per the National Surgical Care Improvement Project (SCIP) which recommends discontinuation within the first 24 hours to prevent the development of antibiotic resistance.